The REM's layout sends trains from Deux-Montagnes, Mascouche, Trudeau airport and the West Island all through TMR. Residents of the Town of Mount Royal are concerned about their quality of life as Montreal's new light-rail network is set to route hundreds of trains their way each day. Over 200 of those residents showed up at town hall for a meeting with their mayor to voice their concerns — some turned away after the room reached its capacity. Expected to be completed in 2024, the $6.3-billion Réseau express métropolitain (REM) will connect downtown Montreal, the South Shore, Trudeau airport, the West Island and the North Shore. 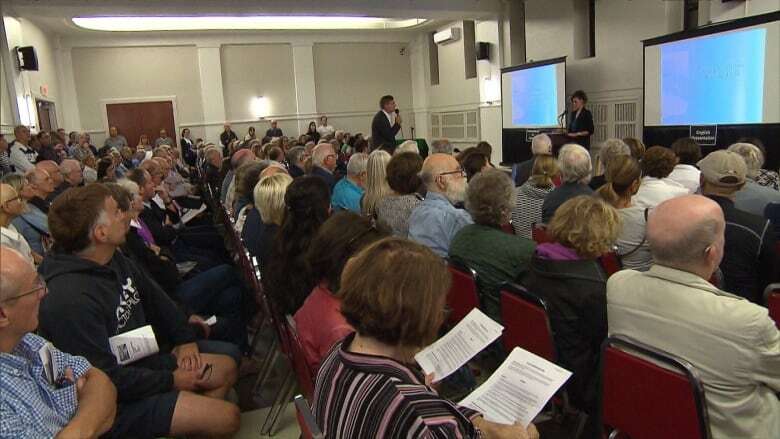 "[It] will really create a complete barrier, almost like the Décarie Expressway," said Joan Fraser, a TMR resident who was there representing the citizens' group Alliance Montreal. "It's literally our backyard," said resident Katrina Valsamis, who has been living in the town since 1989. More than 500 trains will pass by her house every weekday, and hundreds still on weekends, according to the current plans by CDPQ Infra. The CDPQ Infra is a subsidiary of the public pension fund manager, Caisse de dépôt et placement du Québec, which is helming the project, using its funds along with contributions from the federal and provincial governments. "It's not that we're against the REM. We just want to be respected," said another resident, Claude Lacasse. A spokesperson for CDPQ Infra told CBC News that they will be conducting sound tests to ensure the noise levels experienced by residents are unaffected. They said that if any trouble spots are detected, CDPQ Infra would put in measures to mitigate the situation before the train network is operational. Despite those assurances, citizens are still worried about the noise and are also concerned about how the REM will change the look of the town. "At the meeting I attended they seemed to be dismissing the concerns," said Fraser of an information session with CDPQ Infra this summer. The town's mayor says more needs to be done given the unique position TMR is in. "We're creating, going through TMR, a sort of highway of trains," said Philippe Roy. "We felt this is not acceptable." A section of the rail line running through the town is currently above ground. He suggests that it be moved underground, and that the whole stretch be covered to ensure that any noise is suppressed. Roy said he would take what he heard at the meeting and provide a report to CDPQ Infra outlining the concerns of residents.